One of the biggest and most daunting decisions a parent will face when raising their child is how they will educate them. With a growing number of sound options and many overzealous opinions on the superior choice, the decision for education can send any sane parent into a tailspin. But thankfully, the Bible doesn’t tell us which option is “better” for the Christian family, it only mandates parents be faithful to raise their children in the instruction of the Lord, teaching them to love God and others as they follow God’s design for life. While there are strengths and weaknesses to any choice, when a believing parent has a humble heart and desire to honor the Lord, God will not only direct their path but will work all things for their good in Christ. We understand how difficult this decision can feel (We’re right there beside you trying to make the best choices for our young children too!) so during the month of March 2018, Risen Motherhood will be focusing on children's education and the freedom found in the gospel. Below you'll find the links to the shows for our Freedom in School Choice series (we'll link them as soon as they're available), related articles and resources that we pray will help in your decision-making process, as well as a link to a questionnaire we've developed to help moms (and dads!) think through what God has for their family. In all of this, we hope these resources can serve as a launch point for thought, prayer and discussion as you navigate the options. 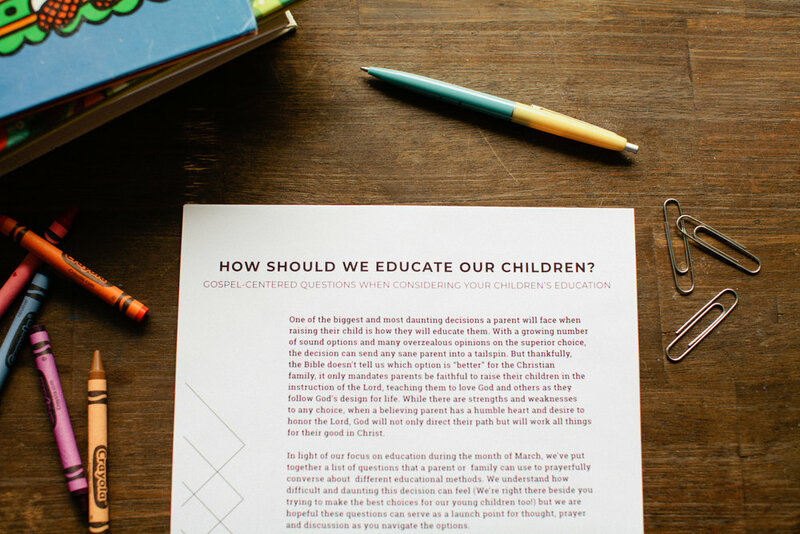 HOW SHOULD WE EDUCATE OUR CHILDREN? and discussion as you navigate the options. This is a free, downloadable PDF. Please print as many as you like, and feel free to share this resource with your friends. If you choose to link to this document, please link to this page, rather than directly to the PDF. We've rounded up a collection of thought-provoking and interesting education articles from around the internet. While we think they're helpful to think through as you make your decisions, the RM team does not necessarily agree with or endorse every opinion in these pieces, and they are not a reflection of our personal education choices. Our hope is that they spark good conversation in your own homes and help offer new viewpoints for your consideration. Enjoy! Home School, Private School, or Public School? What are You Relying on in your Education Philosophy? Ep. 70 | Is Motherhood Your Measure of Success? Want to see more things like this? Join us in bringing gospel-hope to moms - support Risen Motherhood on Patreon.